The National Rifle Association’s response to the Sandy Hook Elementary School shootings sparked protests outside and inside the Willard Hotel in downtown D.C. Friday. That’s where NRA Executive Vice President Wayne LaPierre called for an armed police officer in every school. "The NRA has blood on its hands," chanted CodePink’s Medea Benjamin, who was escorted out of the news conference. Another protester blocked the podium with a banner. 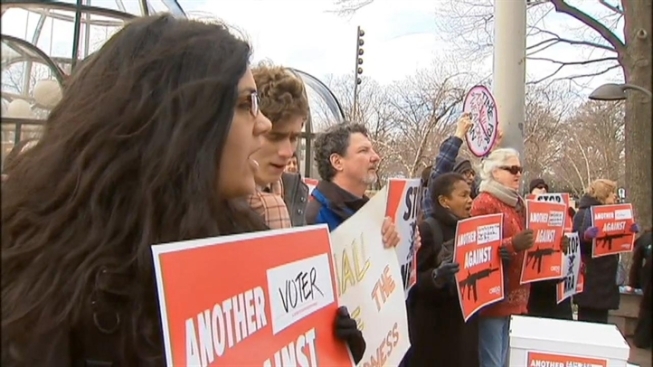 Outside, more protesters carried signs calling for a ban on assault rifles. NRA opponents believe the association is to blame for the Connecticut shooting. "Aside from the shooter, they are more responsible than anyone else,” said Josh Nelson, of CREDO Action. “That's what we are saying." But the NRA said guns are part of the solution. The NRA is appealing to legislators for increased armed school security. "I call on Congress today to act immediately to put armed police officers in every school in this nation and do it now to make sure safety is in place before children return to school in January," LaPierre said. Protesters said the tragedy at Sandy Hook is the turning point. Protester Dave Harvey is a concerned father who didn't have a strong opinion on guns until last week. Now he feels he must take a stand. "I look at the faces of those kids who were killed,” he said. “I can't be passive."